Are you using ACT Fibernet for your broadband connection? Are you worried how to make act bill payment online? This guide will help you. Here, you will get a complete guide to pay your act fibernet bill. ACT Fibernet gives incredible internet connection with the high-speed connection at a reasonable price. Act users are in need of the detailed information regarding Act bill payment in online. The company also gives the mobile app to manage all your ACT account management needs. ACT Fibernet app is a one-stop destination to do many things such as pay your bill, request for new connection etc. Moreover, you can track your data usage and choose the high-speed plan to use more speed and data. You can also register a service or billing query, and purchase Flexybytes. Running around to make bill payment is a headache for all so you can use this app to stay on top of bill payments. With this app, you can pay bills anytime and anywhere without worrying disconnection, late payment, or other inconveniences. Do you wish to pay act bill in online? Well, you have different kinds of act bill pay options to explore. Users can use anyone of this choice to make online payment without any hassle. All these options are easily available and easy to access. Some of the payment options are available to pay bill online such as through credit card, debit card, net banking, etc. In this guide, you will get the complete payment information with step-by-step manner. It will be helpful for you to pay act broadband bill payment online without any hassle. You can make act fibernet bill either pay through mobile app or act fibernet bill payment online portal page. Besides, using different methods you can also pay bills. So, follow the below steps to complete your act fibernet bill pay. When we click on send OTP , we will get OTP to registered mobile number. Just Enter OTP Received to your mobile. From the ACT database, the bill details retrieved along with username, account number, bill number, bill amount etc. 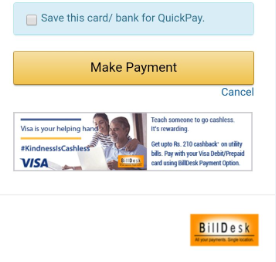 Select payment option and then bill desk. After that, click pay now and then you will be redirected to the payment gateway page where you have to choose the payment method. If you choose credit/debit card option, you have to enter the 16-digit card number, CVV number, exp date, and cardholder name in the card. Finally, click on make payment. Alternatively, you choose net banking option give your username and password of net banking and proceeds further steps to make payment. Now, complete the process of payment authentication with PIN or OTP. Once the payment authentication is successful, you will be redirected to a confirmation page. There, you have to check the payment details such as payment date, bill amount, and track ID. Moreover, you will also get the message through registered mobile number.